Discussion in 'Henson People' started by Phillip, Sep 23, 2013. Fans have been waiting more than 20 years for the first biography on Jim Henson's life with full participation and support from Jim Henson’s family and creative partners. He's one of the twentieth century’s most innovative creative artists: the incomparable, irreplaceable Jim Henson. Read the wonderful prologue for "Jim Henson: The Biography" and let us know your thoughts. Save off the regular price, order "Jim Henson: The Biography" on hardback, paperback and eBook and "Jim Henson: The Biography" audiobook on CD with a low price guarantee. If you've ordered or read "Jim Henson: The Biography" please like this post and share your thoughts below. SpookyMania, Chopped Liver, ShanaynayXD and 3 others like this. I'm really excited to read the bio! My sister works at this library in New York City and asked me to help put the word out for this upcoming book signing with Brian Jay Jones in a few weeks. I would love to be there, but live several states away, so if you live in or near the city, please be sure to attend this event! I'm excited I'll be picking one up tomorrow. Just picked one up, and I'm currently in the second chapter. Brian Jones really goes deep into the story with some really deep backstories on the Henson Family dating back to the 1880s! I've got it on reserve at my local library. Just waiting for it to go through processing. I like how Brian Jay Jones knows his stuff. 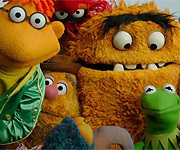 In past books about Jim, people would have described characters such as Big V, a "long nosed monster" but Brian actually puts the names of the Muppets. He mentioned Mushmellon for frog's sake! 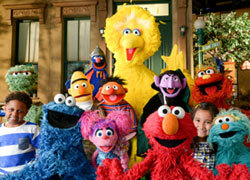 Also, has anyone noticed that NONE of The Muppet Show Muppets appeared in the trailer? Probably because of the Disney copyrights stuff. I hope they are talked about in the book. I'm half way done with it. Really good so far, although it's mostly information we've heard snippets of over the years. Jones doesn't analyze Henson much, he leaves that up to us. Really satisfied so far. I'm curious if the book has any rare photos in it, that's always a plus for me! It has a lot of photos from Jim's early childhood midway into the book. Apart from what CaseytheMuppet mentioned, most of the photos have been in other books, save for some really candid shots taken by Henson's first post-Jane lover. Well I got to read some of it in the book store today. I have to admit one particular story nearly made me cry and I don't mean that flipantly. It's just all very enlightening concerning Jim's relationship with the performers, especially Richard Hunt. Jim had a challenge in balancing friendship with running a business. Really great so far...love the depth Jones goes into while discussing Jim's family history...also learning about the development of Jim and Jane's relationship....currently in chapter 5...really great stuff. The audio book is fantastic as well...great to listen to while driving! I just read the prologue and had to smile when reading about how Joey kept saying "Cookie Monster" when singing the alphabet. I can hardly wait to read the entire book. I really hope that we get a movie from this book. Finished it. The ending goes into excruciating detail regarding Henson's death... I felt sick reading on the subway. Really strong writing, terribly, terribly sad. The reviews and praises are just so exciting. Unfortunately I'll have to wait at least three months since I am going to ask for this as a Christmas present. So until then, I don't want to read any text from the book, that way I'll be surprised at some of the things that Mr. Jones has written. I did skim through a few of the photographs at B&N however, but most of them are pretty common for us diehard fans anyway. Congratulations Brian Jay Jones on a job well done and thank for making Jim's story come to life. Earlier this week (on Tuesday), since I had 2 hours to kill in between my classes, I went to Barnes and Noble, and sure enough I found it with the other new books just a few seconds after I got into the store. I skimmed through it, and I must say that I enjoyed everything I saw (I didn't have time to read the whole book), and I'm going to request it as a Christmas present from one of my parents or one of my relatives.